Vertically growing plants are an attractive feature of many vegetable gardens as well as being an excellent space-saver. Climbing peas and beans (especially pole beans) can be some of the most productive plants you can grow, but providing strong supports for these plants is essential. When the seedlings first emerge they may seem small and delicate but by the time the vines have wound their way up to six feet tall with a thick mass of leaves and pods the supporting structure will have to be strong enough to take the weight and sturdy enough to survive winds. A huge variety of supports can be bought or built for these crops and the best option will depend on materials, time, budget and personal preferences. For ornamental gardens it will be important to consider the aesthetic aspects as vertical supports often draw the eye in a garden and can make a big difference to the appearance. At the other extreme, in community gardens practical recycled solutions often rule and with a little ingenuity all sorts of ‘junk’ materials can be used to make good supports. Recycled Materials: In community gardens, left over building materials such as steel rebar (the steel supports used in reinforced concrete) are often used as they are easy to drive into the ground. 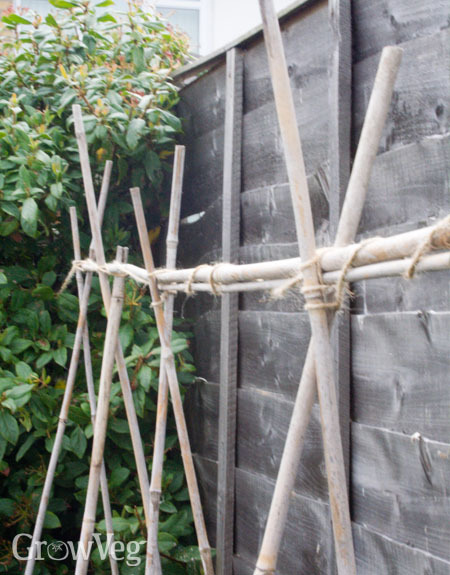 Spare timber can also be made into sturdy frames. Arch: One of the most beautiful designs, especially when peas are flowering, is to grow them up over an arch between beds or over a walkway. Arches can be costly to make and unless they can be moved they limit crop rotation to the legume and squash families (if you only want to grow edible climbing plants) but those may be sacrifices worth making if you enjoy the display. Attractive steel arches are available from many gardening stores and suppliers.